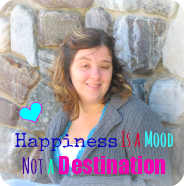 Happiness Is a Mood Not a Destination: Blackberry Cobbler + a Giveaway! If you remember from two Mondays ago, I wrote about our weekend and how we went blueberry picking. You can read it here if you havent already! I mentioned how we live 5 minutes from the country which means we get the please of going to the farm and getting to pick all sorts of things. This past Saturday my mom, grandmother and I took an impromptu drive down to the farm to pick blackberries! My mom and grandmother are big fans. Me though, not so much! I think they have too much of a sweet/bitterness to them. We got a good amount and they were big! My mom searched on pinterest for a nice easy recipe and came up with this one. I tried some and it was actually really good. I would choose an apple crisp over it, though, any day but it was good and I'd have it again. Stir together egg, sugar, and flour in a medium bowl until mixture resembles coarse meal. Sprinkle over fruit. Bake at 375° for 35 minutes or until lightly browned and bubbly. You can find me over at Rachael's blog as I help host this fabulous giveaway. 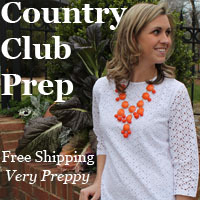 First of all, thank you to AMY O jewelry and Country Club Prep for sponsoring this! and you deserve to be spoiled! Sara from Sincerely, Sara will also be helping sponsor this giveaway! Check her out! She's an AWESOME and inspiring creative writer! giveaway on her site as well! Kristen has become one of my best blog friends! and also the beautiful seafoam Hamptons Weekend Bib. I am so excited for one of you lucky readers to be pampered by winning this giveaway! to enter. Remember to check back daily because a lot of these entries can be done each day! I love the Johnnie O fleece jackets so it might go toward s one of them. YUMM! Sounds so good!! Thanks for linking up! Oh yum. I've been wanting to make peach cobbler but think I may have to try this sometime soon instead! I love going to pick fresh berries. it's so fun and they taste so good! yay! This is so funny... But I went blackberry picking last week. I've been posting what I've been making with mine too. So glad to see I'm not the only crazy! !